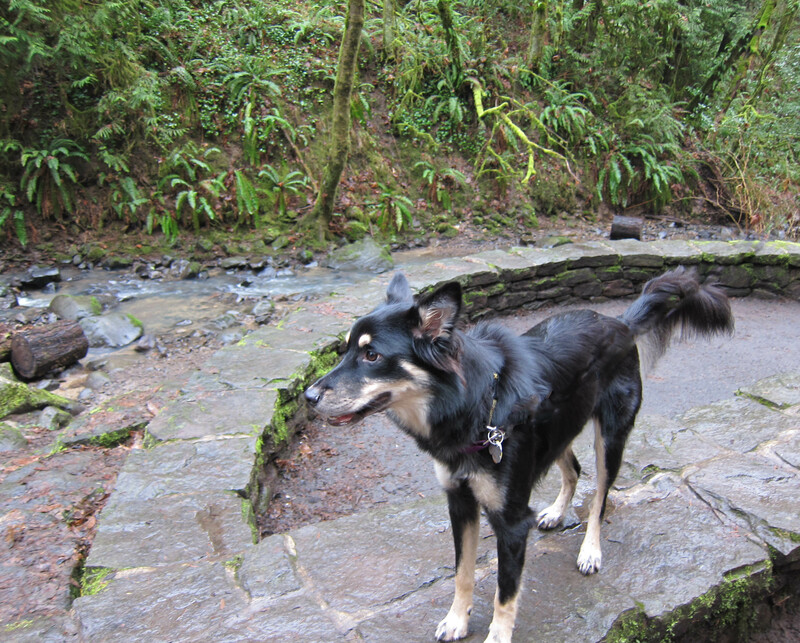 Last weekend, Toby and I went on a long hike in Forest Park. Mom’s been wanting to go there for a LONG time and the weather has been pretty nice lately. That means it isn’t raining all the time–Portland’s like that in the winter. It rains a lot, but we have some really pretty days too. It also means we have lots of green in the summer! And lots of water–just for ME (not that I like water or anything). Forest Park is the “largest, forested natural area within city limits in the United States”, covering more than 5,000 acres. Toby and I have to be on a leash all the time, but that’s OK; I let Mom Photoshop them out. (She’s been practicing). 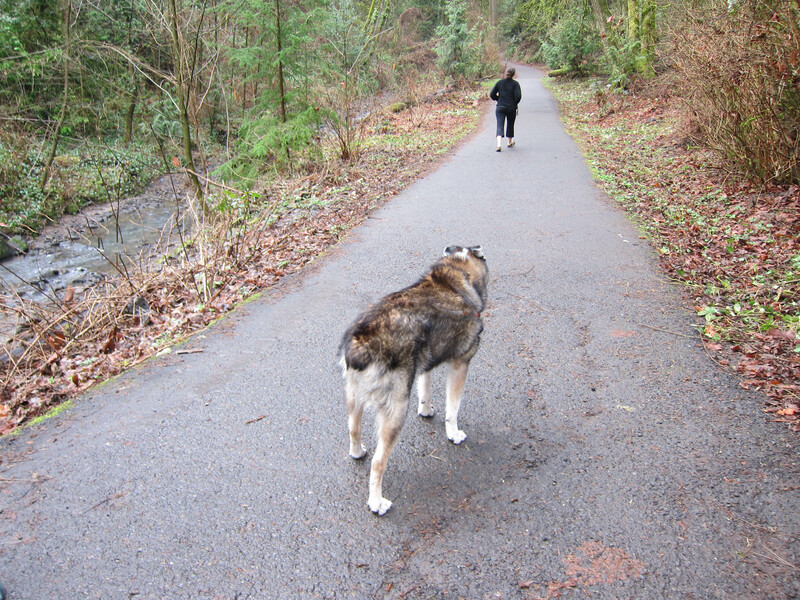 There are lots of trails and the main one (Wildwood) is 30-miles long. Mom said we weren’t going that far…. 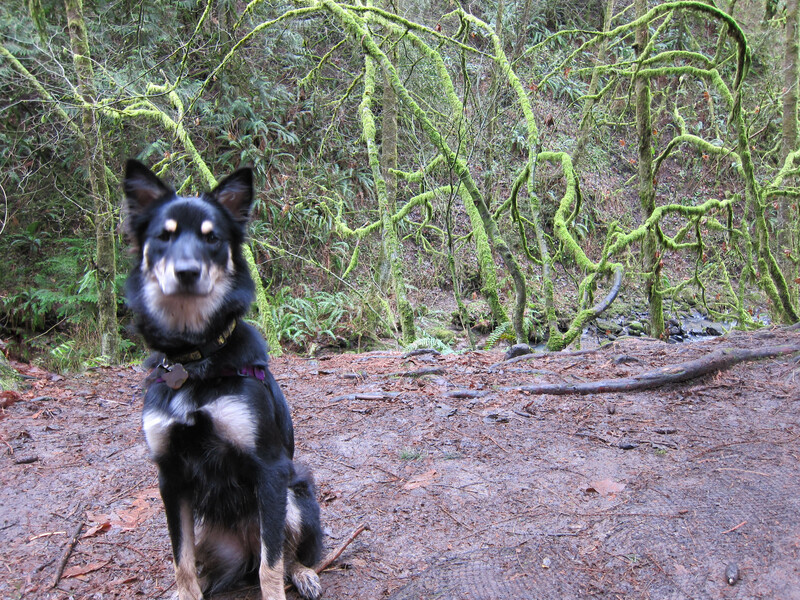 So, we started out on one of the that ran along a stream. Get it? WATER! Where else would I go? 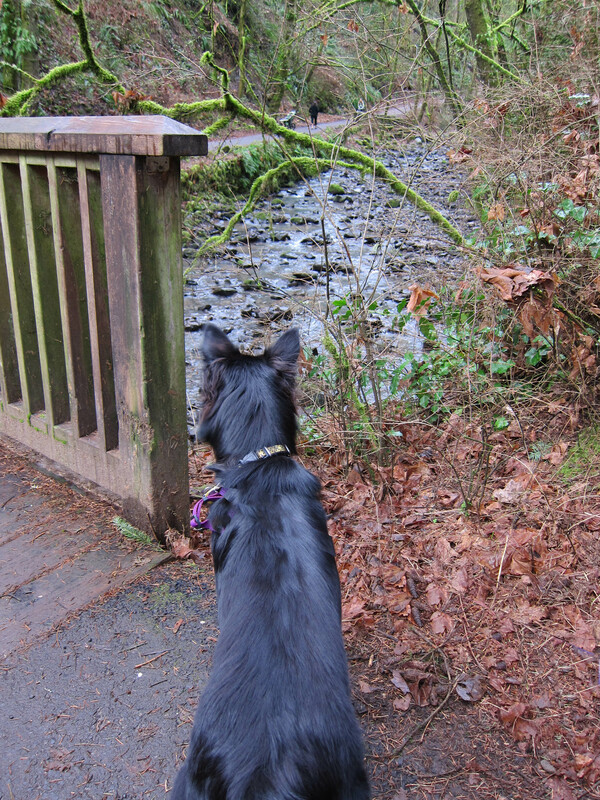 This was a nice little stream that came down from the hills in Forest Park and eventually goes out to the Columbia. Did you know that “in 1803, William Clark (of Lewis and Clark fame) paddled far enough up the Willamette River to see Forest Park’s present location. He described this forest as having Douglas fir as its predominant tree, with trunks ranging from five to eight feet in diameter”? 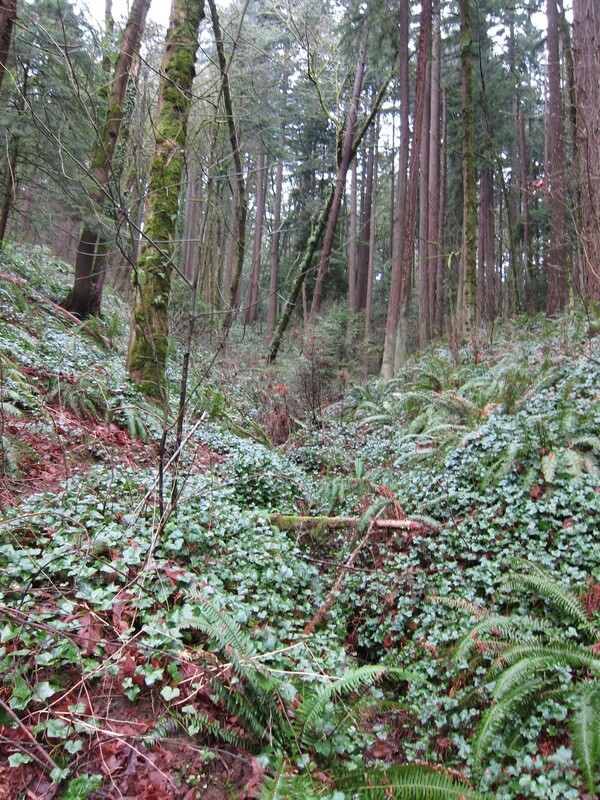 It was forested over the years, so those old-growth trees aren’t there any more. The Park is still full of Douglas-fir, western hemlock and western red cedar but there are more hardwoods than evergreens now. 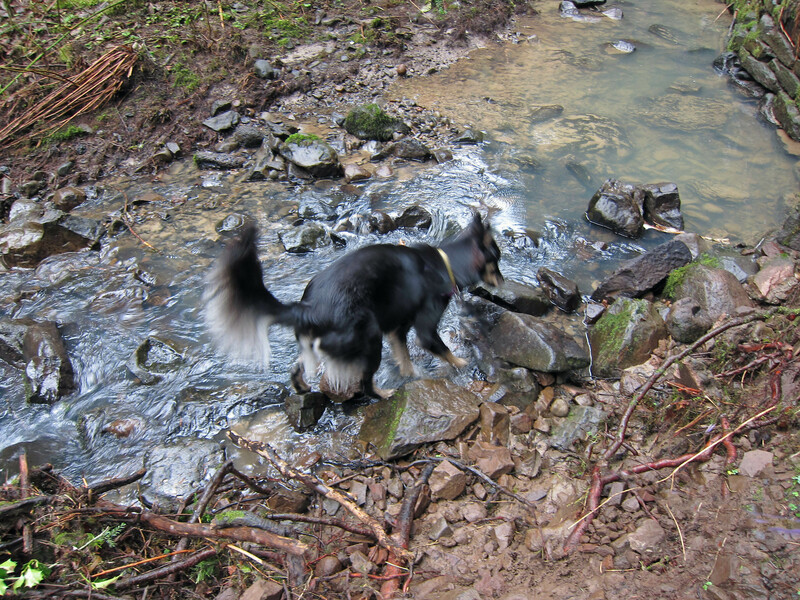 We walked along this stream for a while and Mom even found a place where I could go down and get in. Since my leash was still on, I couldn’t do it justice. Looks like I did though!! 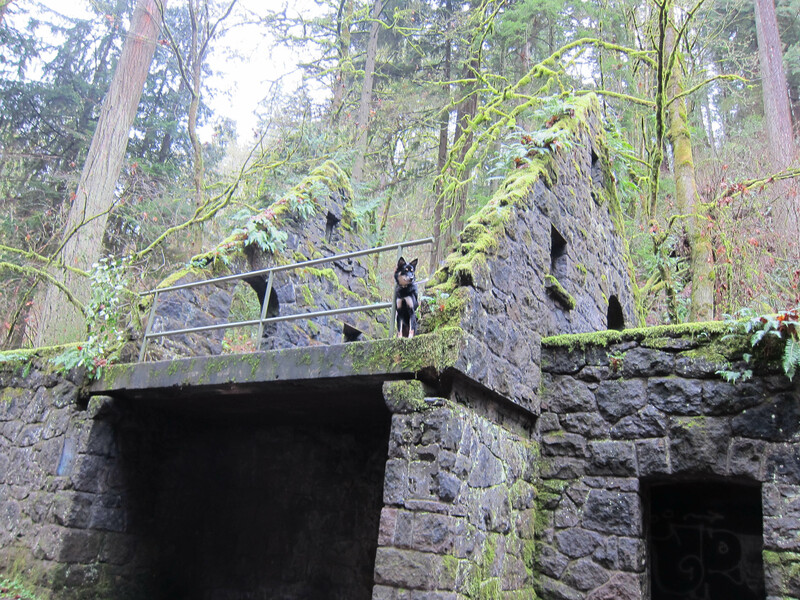 We got to the juncture of the Wildwood trail and found the ruins of this Stone House. We thought maybe a settler had built this house overlooking the stream in the middle of these wonderful woods. But Mom found out that it really was “built in the mid-1930s by the Works Progress Administration (WPA) as a public restroom. The infamous Columbus Day storm on October 12, 1962, took out the water line” so the building was gutted rather than repaired. Mom says that wasn’t what she expected, but I thought it was a good vantage point! We took the Wildwood trail fork and went uphill for a couple of miles. We could see the Columbia way off in the distance. It was very pretty, even in winter. This is a place along the trail. On the way back down, we saw these moss-covered trees near the Stone House. I thought it looked like we were in a fairy land!